For many visitors, simply driving along the valley admiring the gorges, with dips in some of the numerous pools, is more than adequate. The gorges are so beautiful that it is definitely worth doing the drive even if you are not going to do one of the walks. The gorge does become quite busy but there are a reasonable number of passing places for cars. The rocks on either side of the gorge are very dramatic and covered in trees, mostly pine and birch, but also lots of flowers such as green-flowering hellebores and white and pink cistus. Generally over the island there are thousands of green hellebores and it turns out these are native to Corsica and Sardinia. 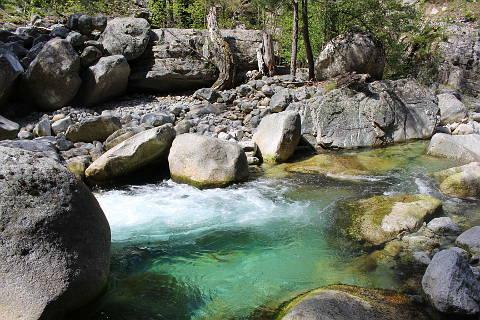 Below the cliffs the fast moving river flows over rocks and boulders and forms beautiful turqoise pools along its length. Positively crying out for a quick paddle! If you wish to do a walk there are several paths of varying difficulty. 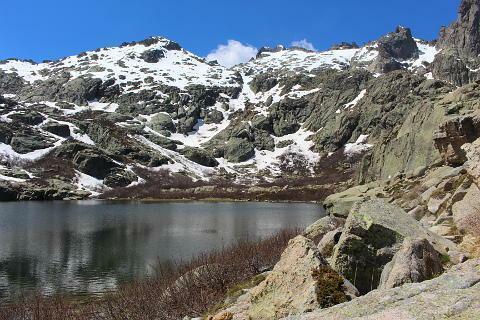 The most popular path with visitors is to the two lakes - Melo and Capitello - and requires about four hours round trip. Although this is labelled as easy it is quite strenuous. 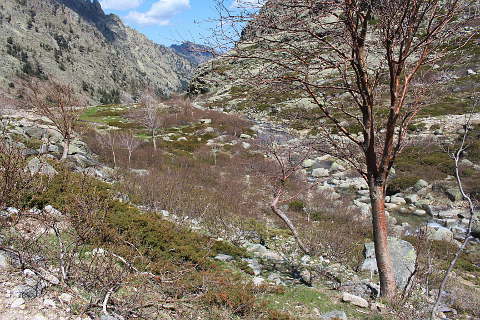 One other popular walk is to Monte Rotondo (height 2,600m), standing high above the valley, through the pine forests. This walk requires a degree of experience and preparation. 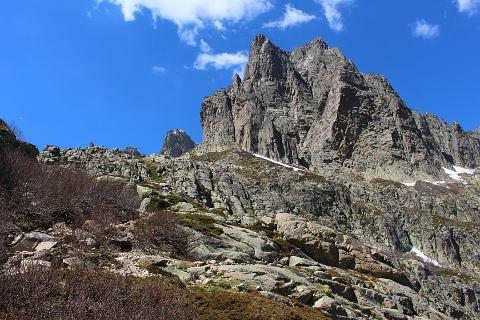 We decided to do the walk to the lac de Melo whilst in the Restonica valley. There is a big car park at the start of the walk costing 6 euros (2016). To begin with the walk is fairly flat but as you are walking on rocks and boulders walking boots are best even for this part. The further you progress more clambering over boulders is necessary until you get to the wider part of the valley where the ascent starts in earnest. 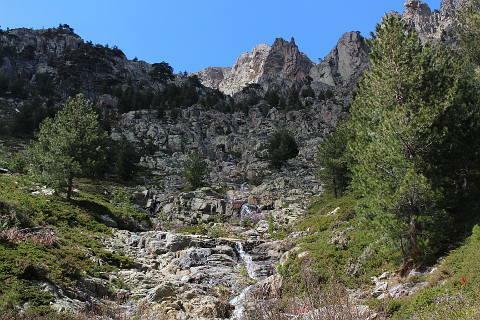 The first part of the ascent involves a fair bit of scrambling as the path follows a dry stream bed. However there are no steep drops or anything too difficult. The last part of the walk though is much steeper and in one part near the end there are chains to help you climb round the rocky path and then 2 ladders, one of which is vertical. I suffer from vertigo and found this part very difficult but not impossible. There were a few though who turned around here unable to continue. A bit more clambering but nothing too arduous and you find yourself at the lake. A large tranquil space surrounded by mountains and populated by a colony of crows wheeling around in the sky above. Now I'm back on terra firma - definitely not to be missed! 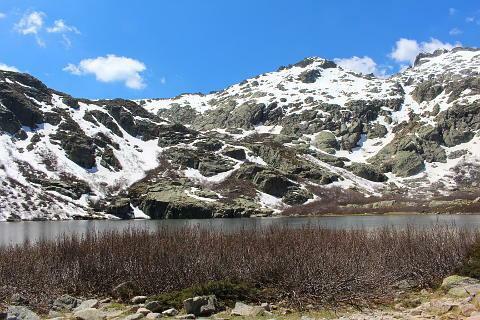 Note that because the mountains are high (several here are over 2000 metres) many of the mountain lakes remain frozen outside the summer season. 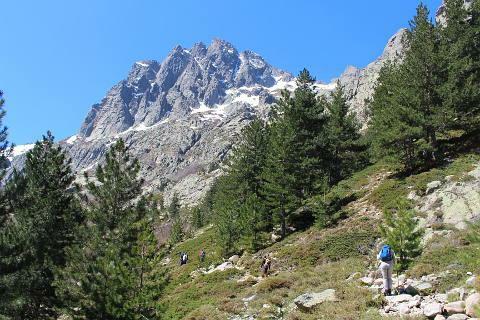 Due to its beauty and accessibility, the Restonica Valley is very popular with visitors to the island, and the road from Corte to the Bergeries de Grotelle (where visitors park) can become very busy in high season.